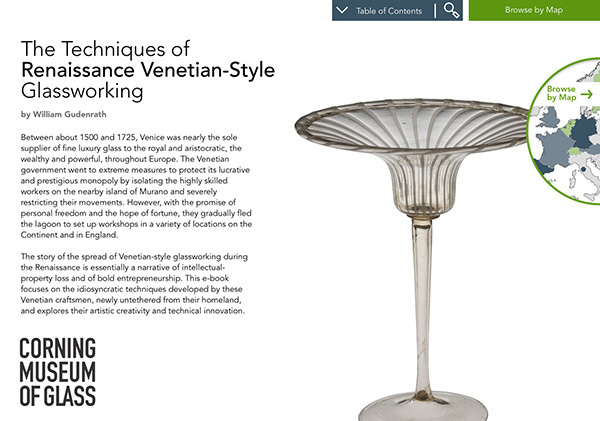 While this resource is specifically about the manufacturing processes that probably took place in Venetian glasshouses during the Renaissance, some mention of the material and its making should be added. Today, we might naturally be inclined to think that glass is not particularly difficult to make. After all, it is routinely produced around the world in both immense industrial and small studio settings. Moreover, with the exception of fine optical glass and exotic specialty glasses, glass is regarded as an inexpensive material. However, we will see that, in Renaissance Venice, glassmaking was a complicated, laborious, and expensive enterprise. It would be difficult to find a more unlikely place for locating a glass industry than on the islands of Venice and Murano, which are small and surrounded by shallow waters. None of the essential elements involved in the making of glass were either native or located nearby. Even with Venice’s unmatched mercantile fleets in the Middle Ages and later, it must have been costly and difficult to meet the glassworkers’ incessant need for supplies. A reasonably steady supply of the two key resources for glassmaking—fuel and raw materials—was required. By weight and volume (two major concerns in shipping), fuel was probably the most taxing transportation requirement for glassmaking in Venice. Wood is both heavy and voluminous. Huge quantities of thoroughly dried hardwood had to be kept on hand at all times when the furnaces were in operation. It would be difficult to find a more unlikely place for locating a glass industry than on the islands of Venice and Murano, which are small and surrounded by shallow waters. None of the essential elements involved in the making of glass were either native or located nearby. Raw materials were imported from near and far. In Renaissance Venice, glass required what would be called, in modern glassmaking terminology, a former, a flux, a stabilizer, and a decolorizer. The former was silica. Glass can be made using beach or river sand, but sand is often accompanied by iron, an element that turns glass green. We know that, by the middle of the 14th century, the Venetians were importing quartz pebbles from the Ticino and Adige Rivers as their source of silica. The pebbles, reasonably free of iron, were pulverized into fine powder before they were used. The flux, which was essential for lowering the melting point of the silica, was acquired in the form of plant ash. As early as 1285, this was being imported from Syria and Egypt. Later, coastal plants from Sicily and Spain were imported, carefully processed into soda di Catania, and used as a flux. The last key ingredient in the making of reasonably colorless glass was manganese dioxide, sometimes colloquially known as “glassmakers’ soap.” The use of this compound as a decolorizer in glassmaking has been known since at least 1290. It was acquired in the Piemonte region of Italy, some 250 miles west of Venice. The great advance in glassmaking that strongly affected the Renaissance Venetian glass industry was the development of cristallo in the mid-15th century. Angelo Barovier (about 1400–1460), a chemist working on Murano, devised a process for purifying the plant-ash flux that resulted in a glass rivaling rocca di cristallo (rock crystal) in clarity and colorlessness (hence its name). This was, however, by no means the first time that the Venetians had made an impressive colorless glass. In the best examples of the late 13th and early 14th centuries, the beakers of the Aldrevandin group (see An Historical Overview of Glassblowing in Venice: The Aldrevandin Group), the quality of the glass seriously rivals that of cristallo, which was made 150 years later. The Rothschild Bowl, opaque white glass with gold and enamel decoration. Venice, about 1500–1510. H. 5.9 cm, D. (rim) 14.1 cm, (foot) 6.3 cm. The Corning Museum of Glass (76.3.17, purchased with funds from the Museum Endowment Fund). The Turquoise Goblet. Venice, about 1500. H. 18.9 cm. The British Museum, London (WB.55). Photo: © The Trustees of The British Museum (WB.55AN1537486001). In addition to cristallo and vitrum blanchum, a number of colored glasses and specialty glasses (as they would be called today) were made by the skilled Venetian glassmakers. By about 1500, an intensely opaque white glass was being made and decorated with gold. It rivaled Chinese porcelain in its opacity (Fig. 43). Turquoise and lapis blue glass used the same tin-oxide base glass as opaque white glass, with the additions of copper oxide and cobalt oxide respectively (Fig. 44). Intensely colored cobalt blue and emerald green glasses were made, probably by starting with a decolorizer-free colorless glass and then adding cobalt oxide and iron and nickel oxides respectively (Figs. 45 and 46). Armorial goblet, blown, mold-blown, tooled, enameled, gilded. Venice, possibly 1480–1490. H. 19.7 cm, D. (rim) 13.3 cm, (foot) 13.4 cm. The Corning Museum of Glass (79.3.193, bequest of Jerome Strauss). Beginning with mid-16th-century stemware, the colored glass that is most often seen accompanying cristallo is transparent aqua. This was made by tinting colorless glass with copper oxide. In greener aqua glasses, analysis always reveals the intentional addition of iron oxide (Fig. 47). Some specialty glasses can be notoriously difficult to make successfully, even today. This is because, in glassmaking, the “thermal history” of the glass is often as critical as the correctness of the ingredients. Aventurine, a glass that was popular in the 18th century, features a multitude of brilliantly sparkling tiny metallic flakes (Beaker with Chalcedony Glass and Aventurine). Although the flakes look like gold, they are, in fact, copper crystals. In order for them to form properly and to “grow” to the right size, the molten raw materials must be brought up to a specific maximum temperature at the correct rate, held there for just the right amount of time, and then—most critically—cooled inordinately quickly. Any errors at any stage would result in a failed melt. This is the basis of the name aventurine: making this specialty glass was considered a risky and potentially costly adventure. Winged goblet, blown, applied, tooled. Probably Venice, 17th century. H. 17.3 cm, W. 11.1 cm, D. (foot) 11 cm. The Corning Museum of Glass (2000.3.13). The glass known as calcedonio was popular at both ends of Venice’s “golden age”: about 1500 (Fig. 48) and the 18th century. It is an inhomogeneous glass colored with silver. Specialty glasses undoubtedly added luster to Venice’s image as the glassmaking center of the world during the Renaissance. It was, however, the ability to make a rock crystal–like glass that set Venice so far apart from the other glassmaking cultures of that day.